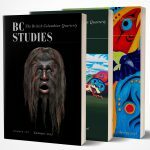 The 14th Annual BC Studies Online Auction is live! The auction will run from mid-day November 23 to 30th and features over 160 items, including books, gift baskets, sports and entertainment tickets, travel accommodation vouchers, and much more. BC Studies would like to thank all of its kind donators and supporters for participating in the 14th Annual Auction. Click here to go to the auction site, where you can browse the auction items, create an account, and make your bids!